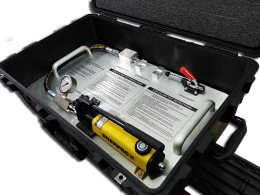 When using any of CDI's SWX Pressure Switch Modules to provide transmitters with the capability to begin transmitting at a specific pressure, purchasing one of these high quality test stands ensures that you will be able to test and confirm in your labratory or in the field prior to deployment that the transmitter is bahaving as desired. Each test stand is built to order to accommodate the transmitters purchased. 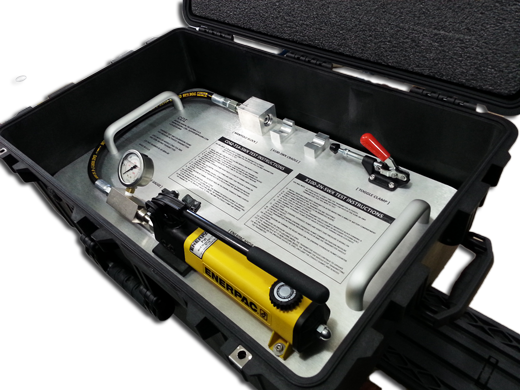 As seen in the photograph to the left, the test stand comes with a removable aluminum base plate to which an Enerpac hydraulic pressure pump is mounted. A high pressure hose connects to a pressure block which mates to your specific model of SWX pressure switch. An analog or optional digital pressure gauge provides a continuous read out of the pressure applied to the closed system. An operator slowly pumps the pressure in the system up while watching the gauge. When activation pressure is reached, the transmitter should begin transmitting. 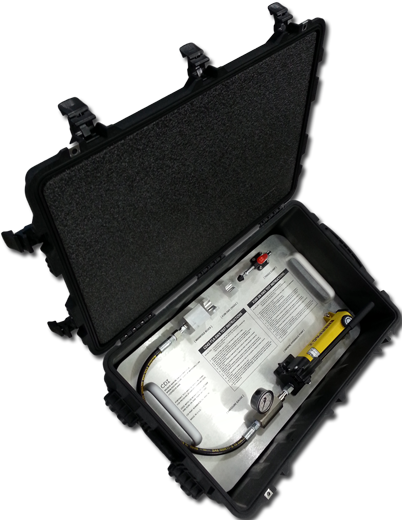 This is verified by using one of CDI's high quality pig tracking receivers such as the TRAXALL 720 or 770. In addition, since each of our SWX pressure switch modules has the ability to have its ON pressure adjusted by the user, these test stands provide operators with a means of verifying their own in-house adjustments to of SWX module. 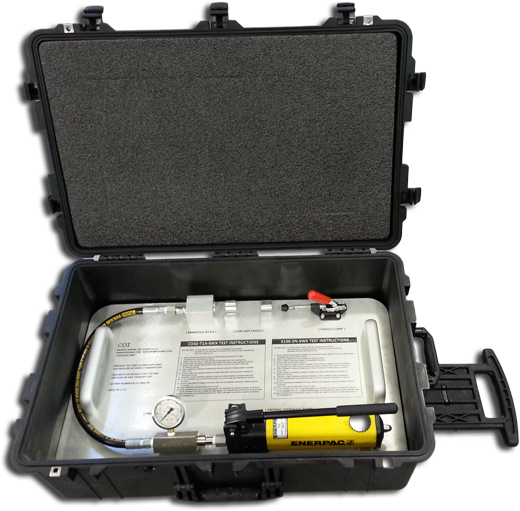 As seen in the photos, clear instructions are indelibly laser printed directly to the base plate of the system. Call CDI for pricing on SWX Modules and our Test Stand today!